Flavored vodkas are growing in popularity, with dozens of flavors popping up where there were once only a few. Instead of basic lemon and lime-infusions, you can now find much more creative flavors like cake, whipped cream and marshmallow. After a pre-Easter Peep-buying spree, I set out to make my own marshmallow-infused spirit using the popular marshmallow chicks. I filled up a large jar with Peeps, poured in a bottle of relatively inexpensive vodka (don’t get something terrible, but don’t sacrifice something very expensive for this kind of project) and let it steep in the refrigerator for a few days. 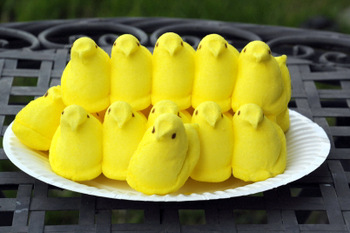 I decided to use a lot of Peeps – not just two or three – to get in as much Peep flavor as possible. All of the exterior sugar of the marshmallows came right off, and the Peeps partly dissolved, infusing the vodka with a subtle sweetness. So when you taste the vodka, you will get a hint of sugar up front, followed by the flavor of whatever vodka you chose to use. It’s pretty good – and while it doesn’t have a distinct Peep flavor (do Peeps have a distinct flavor? ),that doesn’t make the project any less fun. You can use this vodka in just about any cocktail, and it actually makes a fun centerpiece for an Easter party. Peeps come in a variety of colors, but they all taste just about the same. 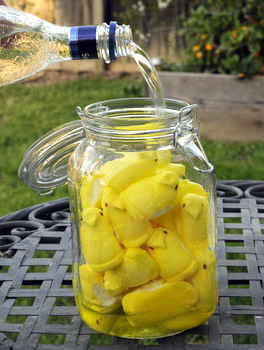 The classic Yellow peeps are my personal favorite and I chose them to infuse my vodka. Feel free to work with blue, purple or pink Peeps, but I don’t recommend mixing and matching the colors because it will result in a less-than-pleasant-looking finished product as the colors mix. The yellow turn out a vodka with an almost limoncello color to it, which is easy to incorporate into drinks. 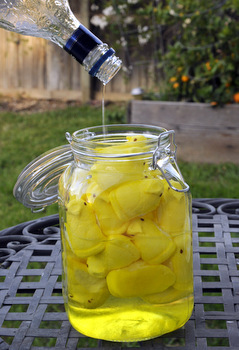 Once you’ve made a batch, try making some Peep Vodka Lemon Drops with it to celebrate! 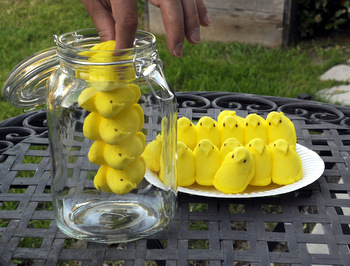 Place all Peeps into a large jar. Fill with vodka. Allow Peeps to marinate in the vodka in the refrigerator for 3-4 days. 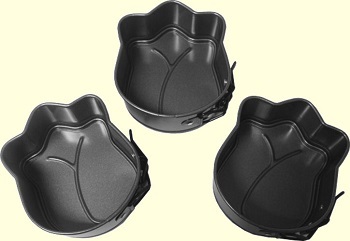 Vodka can be used as-is, or PeepÂ remnantsÂ can be removed by straining vodka through a coffee filter. How to Make Peeps Vodka | How Can I ... ?